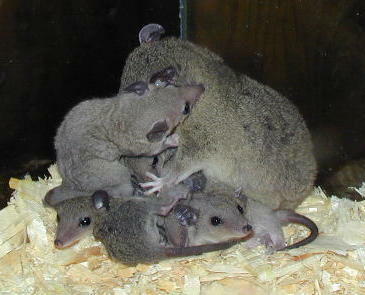 Members of the Genus, Monodelphis include a large group of American marsupials, consisting of at least 22 species. Although they all bare close similarities, they are all unique and therefore have been broken down into 8 groups. There is also one other group that is being studied but has yet to be named. In the wild due to overlap in territories hybrids are a natural occurrence. In their wild habitat this species is considered common and of least concern. They are a tropical species that is native to South America. They are usually found living in dry rocky areas at the edge of rainforests in Brazil, Bolivia and Paraguay. They are solitary animals who establish a relatively small territory and often live out their lives in only 2 acres or less. Short-tailed Opossums are often described as being nocturnal but we find that ours are a lot more active during the first few hours after twilight. We seldom notice much activity during the midnight hours but occasionally we see them being active just before dawn, which makes me think that they are more of a crepuscular species. They typically build their nests using leaves and twigs in rock crevices and in hollows of trees. They are also known to venture into people’s dwellings and abandoned buildings. They are one of the few wild species that seem to benefit, from the habitat disturbances that we humans cause. Many indigenous people welcome the S.T.O.s into their dwellings to help keep insects and other types of pests under control. During the 1980s, S.T.O.s were imported into North America to be used for scientific research in labs. Before long a few hobbyists discovered how unique they were and what a wonderful disposition they had that it wasn’t long before they made their way into the Pet Trade. During the 1990’s more people became fascinated with this unusual animal and a select group of breeders started to promote them as pocket pets. In North America and Europe, Short-tailed Opossums are still considered as a relatively new type of pet and are still considered rare in captivity but they are becoming increasingly popular pets. While the demand for them as pets is steadily climbing, do to the scarcity of this unique species we feel that it is very important to be extremely selective when placing them into pet homes. We prefer to sell them as pairs to Specialty Pet Enthusiasts who have a keen interest in selective breeding. As a result of selective breeding practices, new colour morphs are beginning to appear. New colour morphs are a work in progress but now if you search hard enough, you’ll be able to find rosy breasted, pied and a few other colour mutations. 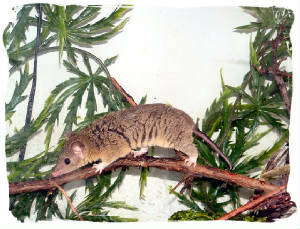 At a quick glance Short-tailed Opossums could be mistaken for a type of arboreal rat. 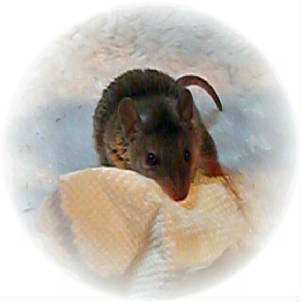 Although their tail is semi prehensile, to some people it might be described as almost rat like in appearance. 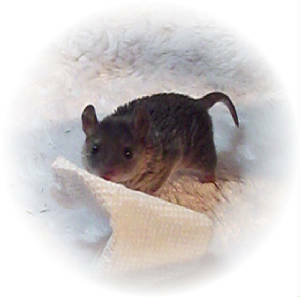 Their tails are not as whip-like as a rat’s tail and they use their tails in a number ways. Their tail can be used to carry nesting material back to their dens or to help with balance when they are hunting prey on small branches. In the wild type variety, their fur is grey to somewhat of a charcoal grey colour. Short-tailed Opossum males are typically larger than their female counterparts. Body measuring in at 10-15cm and their tail is an additional half the body length. Weight is typically around 90-155g. 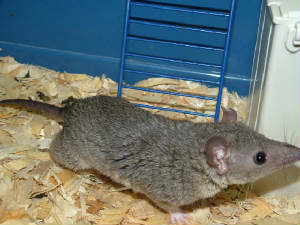 Females weigh around 80-100g. Short-tailed Opossums are marsupials but unlike many marsupials all ‘new world’ marsupials lack the pouch. 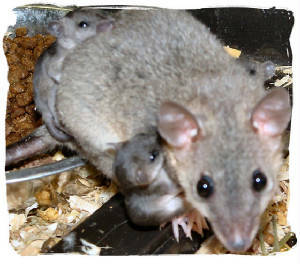 Instead of the security of a pouch the babies attach themselves to a teat. Then the teat swells in their mouth, which helps them, to anchor themselves to their mother’s belly. They remain holding on and attached until they can walk around and cling onto their mother independently. They have excellent nocturnal eyesight, an acute sense of smell and large hairless ears that are capable of hearing minute sounds. When these senses are combined it makes them an ideal nighttime predator. Males are typically larger than females and have a visible descended scrotum. Females have 13 teats. In captivity they can live between 5-6 years. In the wild Short-tailed Opossums live on average 2 – 2.5 years. Though they are successful predators that prey on insects, and other small creatures, they are still considered a prey species for many larger predators. Generally males tend to have a shorter life span than females simply because they are more likely to be injured during mating. S.T.O.s are extremely territorial and don’t like the company of other members of their own species. Even during their natural breeding season females will often attack their male suitors. Short-tailed Opossums are omnivorous and opportunistic feeders. If it is alive and they can catch it, they’ll eat it. If it is already dead they will consume it. They feed primarily on insects, small mammals, small lizards, amphibians, crustaceans, eggs, birds, fruit, nectar, plant matter and terrestrial non-insect arthropods (worms). We feed ours a balanced diet consisting of no grain highly palatable protein kibble, cheeses, eggs, chicken, shrimp and small bits of human grade meats. All of the meat we feed is fully cooked and unseasoned. We do not feed live food and while many breeders still do feed insects, baby birds and mice, we do not feel that it is necessary. Over the years we have fed live foods that when offered, our S.T.O.s would consume readily. When we switched their diets to cooked meat we did not notice a difference in behaviour but noticed that more of their babies thrived and reached maturity. Perhaps this is a coincidence? Perhaps the live insects and animals somehow endangered the lives of the babies by injuring them while the mother was chasing them or perhaps the insects and other species passed on harmful bacteria or viruses? Maybe we will never know why this change in mortality happened but we are happy with the choice we made to switch to fully cooked animal protein. In addition to animal protein we feed a variety of fruits and vegetables on a daily basis. Our S.T.O.s drink water from a water bottle and a water bowl. The benefit of the water bottle is that the water stays cleaner longer and open water dishes provide a bit more humidity into the environment. Our animals will use either types and both have their own advantages. No matter which water system you choose it is important that fresh, clean water is available at all times. S.T.O.s do drink a lot of water. Short-tailed Opossums are from tropical and sub-tropical semi-forested areas and clearings within the rainforests. When we humans think of the rainforest, we naturally think hot but this is not always the case. When you live in the under-story of a forest the temperature is more constant and because of the shade that trees provide, it is usually much cooler than in open areas. An STO prefers to build their nest in dry places but the humidity in the air is almost always humid. Ideally, Short-tailed Opossums are comfortable when kept around 20 –22 degrees Celsius or a bit higher and the humidity level should be in the medium range (around 40% to 50%). Most often during the summer months providing extra humidity isn’t required, unless you live in drier regions of the country. But during the colder winter months when forced heated air is used to heat our homes the air is drier. Then we lightly mist our S.T.O cages, with R.O. water, every couple of days. Because we use a humidifier, I am not entirely sure that they need the extra misting but ours sure do seem to enjoy it. When a mother has babies attached to her, being that they lack a pouch, the babies are somewhat exposed and therefore rely on mom and the external temperature to keep them warm. If mom has babies on board we recommend keeping the ambient room temperature at a little higher than normal range (22-24 degrees Celsius). Short-tailed Opossums are extremely anti-social with other members of their own species and must be kept housed in separate cages. While they are solitary and territorial animals, they do develop strong bonds with their keepers. 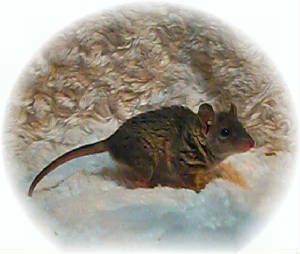 They are best housed in an open-air cage with hamster like wire spacing. Some people choose aquariums or terrariums that are fitted with a tank-topper. Always choose the biggest habitat that you can fit into your space and make sure it is of a size that you can comfortably manage at cleaning time. Be sure it is large enough to add lots of things for your S.T.O. to climb on and lots of toys to explore. They all require an exercise wheel, a water bowl and a sleeping hut for the pets to nest in and clean fresh nesting material. Trying to mimic their natural environment would definitely add to the animal’s health and happiness. Always be sure to add things for them to investigate and to help keep them stimulated. Make sure that whatever you give to your pet is safe. When you choose to use bedding instead of a cage liner; aspen, hay or ‘Carefresh’ all appear okay to use. While not always practical for many pet owners, some people use cage liners. STO’s are very clean animals. Most of our S.T.O.s are potty trained and they have done that on their own. I can not stress enough that Short-tailed Opossums must be housed separately. When frightened they have a tendency to display aggression by opening their mouths wide while making a clicking/hissing sound. This can seem rather intimidating but most of it is bluff. I have never been bitten by an S.T.O. in the past 15 years. With constant interaction especially when started at a young age, Short-tailed Opossums will bond with their keepers. We find that males tend to be more relaxed than females and seem a little calmer. S.T.O.s are not aggressive chewers. They tend to be more of a gatherer and are constantly picking things up by using their tails to carry things back to their nest. Short-tailed Opossums need very little in the aspect of grooming. Proper husbandry and keeping temperature and humidity levels at adequate levels should be sufficient. They are self-groomers and mothers will clean her young until they are ready to be weaned. Never leave your S.T.O. unattended with other pets. Not many species of small animals have any type of advanced natural defense strategies and STOs don’t stand much of a chance when attacked by a larger animal. Normally whenever they are frightened the Short-tailed Opossums will use bluff, play dead or attempt to flee. 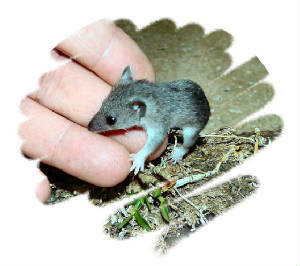 They are small enough to become prey for predatory type animals such as a dog, a cat, ferret, snake or medium size lizards etc.. Yet they are large enough to be considered a predator animal and will prey upon other small pets such as mice, hamsters, birds, small snakes and lizards etc. AGAIN …Never leave your S.T.O. unattended with other pets! Breeding age females are polyestrous and induced ovulators. Since they are solitary by nature sometimes mating can be challenging. When the male encounters a female he’ll sniff to see if she is receptive. They will engage in a ritualistic somewhat violent dance of grabbing, sniffing, biting and licking. The male will eventually immobilize the female and begin mating. It is not uncommon for S.T.O.s to become wounded during mating and sometimes the male risks loosing his life. Males and females can reproduce at 5-7 months of age. They are seasonal breeders in the wild. Breeding season naturally is during the spring and summer months (September – December) and can have two litters per season. In captivity they can breed all year round. They can successfully care for 1 – 13 babies per litter, with the average litter being 7 – 9. Short-tails have thirteen teats so a successful rearing of 10+ isn’t uncommon but if 15 babies were born it is only possible for 13 to attach themselves to a teat. The remaining 2 will perish and usually be eaten by the mother. They start to wean at 3-4 weeks of age and will continue either hanging onto mom or following their mother around for an additional month or more. When they reach weaning age they must be seperated. In captive breeding programs a variety of colour morphs are starting to become established. Rosy, pied, darker / lighter shades of grey and ivory are appearing regularly. All animals can benefit from annual visits to a qualified Veterinarian. Be sure that your vet is knowledgeable about Short-tailed Opossums. The most common reasons requiring Veterinary care is injuries sustained through fights (normally at breeding time) and damaged ears, which is usually a result of low humidity. 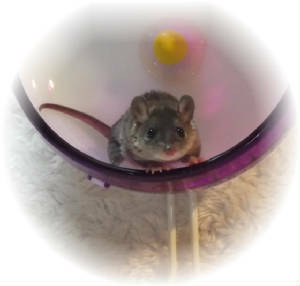 The costs to set up a suitable habitat can vary but you can expect to pay in the neighborhood of $200.00 or more for a reasonably decent setup (including the cage, a few toys, wheels, sleeping dens, etc.). An S.T.O. will likely cost around $175.00 and up, depending on colour, sexes, etc. Ideally,exotic pets should be purchased from "Specialist Breeders". If you are planning to breed. buying your breeding stock from an experienced breeder will likely be worth the investment. Most breeders are proud of their own animals and enjoy talking about them, which can be a great source of information. Not all Pet Stores are bad, nor are all of the people who work in them. Actually some very knowledgeable people work in them. Unfortunately, they are paid to sell and it is a retail business. That being said you’ll need to decide for yourself whether or not you feel comfortable buying pets from them. Sometimes it is better to shop around. Wherever you choose to purchase your pet from, as long as you have done all of your research and you are comfortable with the people that you are dealing with, only then you will you be in the position to make an educated decision. For some people having to make the decision to give up a pet may be one of the hardest things they will ever have to do. It can be very emotional and stressful for the caregiver and the pet. If you find yourself in an emergency situation and need to re-home your pet, try contacting the breeder to see if they can help. We believe that most ethical breeders will do their best to help. Often, in the case of a real emergency, most conscientious breeders will offer to take back the animal. This is a good habit that responsible breeders get into, not only does it prevent animals from ending up in shelters or sanctuaries it also makes people think twice before abandoning them in the wild. People contact us regularly to see if we can help them sell their pet. PLEASE NOTE …We will not help you sell your pet! However if you ever find yourself in a position whereby you can no longer adequately care for your pet S.T.O. or if you feel that your pet needs to be in a home with someone more experienced, you are free to call us. We do realize that every situation is different but we will do our best to suggest a few options for you to consider before you decide to re-home your pet. Occasionally, if we have the space and time, we will take in S.T.O.s that are in need of new homes. Just be aware that if we do commit to taking in your pet, we will keep them for as long as it takes to find them a suitable home. We will not keep them forever because we are breeders. We need to know the lineage and history on all of our animals in our breeding program. We do have a special needs page on our site for people looking to adopt/purchase animals in need of rehoming. If we can not personally accommodate another animal in our own home then we may be able to recommend someone who can. If you are an experienced specialist breeder or a legitimate specialty club and would like to add a reciprocal link to our site please feel free to email us. Please note that we will not provide links to Rescue Organizations that are not open to the public, unless we have the opportunity and time to personally inspect the "Rescue" organizations first. Sorry to all of the people who truly dedicate their time to legitimate animal rescue, unfortunately too often people misrepresent themselves pretending to be licit or scrupulous rescuers. There is little doubt that they are a very unusual species but overall an S.T.O. is not what we would consider an ideal "first time pet". Because they bond with and seem to truly enjoy interacting with their caregivers, they are not what we would consider a display animal (Unlike many types of smaller species kept as ‘specialist pets’ they are not a species that needs to be left alone in it’s cage). They do require a bit more of a complex habitat and diet. Mostly because of their rarity in captivity we feel that serious breeders should keep working with STOs and therefore we consider them more of a ‘Specialist’s Pet’.